I have a computer virus, how do i remove it? Chances are you or someone you know has downloaded something from the Internet that seemed harmless enough at the time but actually contained a computer virus, sypware or adware. Soon your computer has a virus infection and has slowed to a crawl, you get pop ups advertising all sorts of things and your private information may have been compromised. Be careful if you try to remove the virus, it could make it worse. The computer experts at Computer Doctors are ready to scan for and remove computer viruses, stop in or contact us for more information. 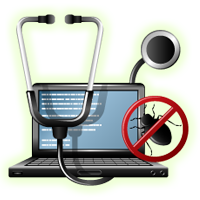 A virus is a self-replicating program enters and infects a computer usually without the operators knowledge. Computer viruses attempt to replicate themselves to other devices and can carry payloads ranging from mild (display pop-ups or messages) to severe (delete or retrieve data). Spyware is software that is installed with or without the computer owners knowledge that collects information. It can collect data that is already on the computer saved in memory or it can monitor and track what is happening on and how the computer is being used. Some types of spyware record the keystrokes typed on a computer including usernames and passwords. Spyware will wait for a third party to retrieve the data or can attempt to deliver the data over the Internet. Adware is a program that is installed on a computer system that displays advertisements to the computer’s users. These are often unwanted and intrusive ads. The adware programs themselves often consume resources slowing down your computer and Internet connection. But I am protected… I have anti-virus installed. Actually a study showed that 32% of computers with anti-virus software were infected with viruses and malware. Keeping antivirus software installed, active and up to date is very important in preventing virus infections, but is not guaranteed to keep you virus free. Call 608-647-5986 or contact us for more information.